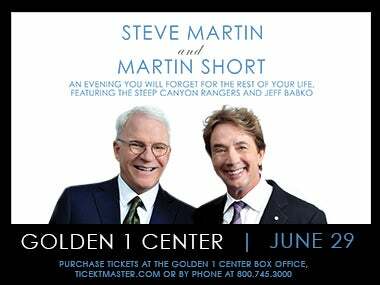 Steve Martin and Martin Short have been best friends for 32 years, can we say #friendshipgoals? After working together on ¡Three Amigos!, there was no doubt these two were destined to be an iconic comedic duo. Recently, the two were on The Tonight Show with Jimmy Kimmel, testing their true friendship. Kimmel questioned them in a “Best Friends Challenge" and the two friends proved to know each other very well. Currently, they are on their nationwide tour, An Evening You Will Forget for the Rest of Your Life with special guests Grammy Award-winning bluegrass band The Steep Canyon Rangers and renowned jazz pianist and Jimmy Kimmel Live band member, Jeff Babko. “There's not a single moment of Evening that feels urgent or inspired, but its baggy, unhurried charm proves to be one of its chief attributes,” says Tim Grierson of Rolling Stone. The special gives a sneak peek of what we have to look forward to from the duo as they come to Sacramento later this month, on June 29. This will be an evening you won't forget.